Flaunt Network is a very experienced provider of free high quality webhosting. Having been a really small network at the very beginning, we have become one of the most popular fansite hosts on the Internet. We also purchased new servers in order to guarantee high quality services to users. Flaunt Network is hosting fansites, design sites and personal sites. 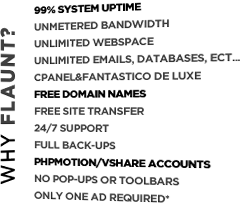 We offer unmetered webspace, bandwidth and free domains (com/net/org/us/biz). Check the appropriate section to read the full list of all services we offer. The network is also interested in purchasing domains and fansites with content. If you wish to sale something, contact us at flaunt.nu@gmail.com. Thank you.